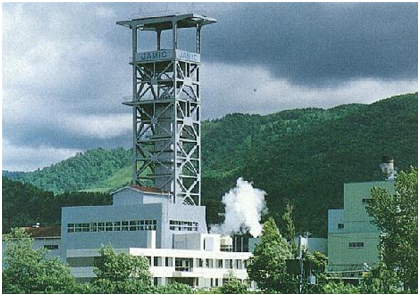 JAMIC, the Japanese Microgravity Center in Kamisunagawa, Japan, is shown in the photograph at the left. 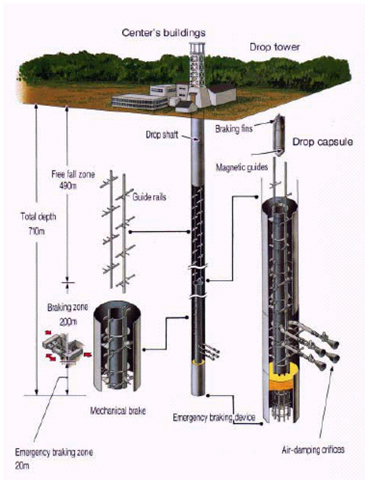 Below the photograph is a diagram of JAMIC drop shaft which provides 10 seconds of microgravity. Aircraft can fly in parabolic arcs to achieve longer period of microgravity of 20 to 25 seconds with g-level of +/- 0.02 g. The airplane climbs rapidly until its nose is about 45-degree angle to the horizon then the engines are cut back. The airplane slows; the plane remains in free fall over the top of the parabola, then it nose-dives to complete the parabola, creating microgravity conditions. Aircraft parabolic flights give the opportunity to perform medical experiments on human subjects in real microgravity environment, complementing studies conducted in space and on ground in simulated microgravity, such as immersion and bed rest. They also offer the possibility of direct intervention by investigators on board the aircraft during and between parabolas. In the mid-1980s, NASA KC-135, a modified Boeing 707, provided access to microgravity environment. 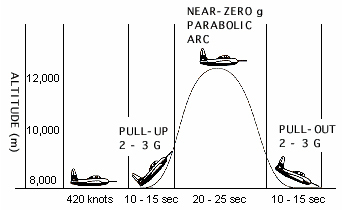 A parabolic flight provided 15 to 20 seconds of 0.01 g or less, followed by a 2-g pull out. On a typical flight, up to 40 parabolic trajectories can be performed. The KC-135 can accommodate up to 21 passengers performing 12 different experiments. In 1993, the Falcon-20 performed its first parabolic flight with microgravity experiment on board. This jet can carry two experimenters and perform up to 3 experiments. Each flight can make up to 4 parabolic trajectories, with each parabola lasting 75 seconds, with 15 to 20 seconds of microgravity at 0.01 g or less, and a 1.8 g pull out. In 1995, NASA implemented the DC-9 parabolic flight program. The DC-9 can achieve up to 40-50 parabola trajectories per flight, with each parabola providing 20-30 seconds of microgravity followed by a 2.2 g pull out. The zero-g Airbus A-300 of Novespace provides for 20 to 25 seconds of microgravity per maneuver. A typical test flight lasts from 2 to 3 hours and made up of 20 to 40 parabolic maneuvers.